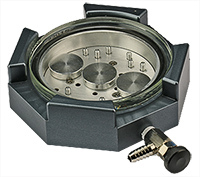 The EM-Tec EM-Storr vacuum sample storage container have been specifically developed by us, to store and protect SEM / FIB / TEM samples and calibration standards under vacuum. It protects valuable samples from air, moisture and dust. The superior EM-Storr vacuum container is constructed using high vacuum compatible materials: vacuum grade aluminim, a hardened safety glass lid, NBR O-ring and an all metal high vacuum valve with PTFE shaft seal. The outside of the aluminium container is hard anodised for protection. 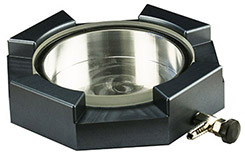 To reduce outgassing and to hold vacuum for extended periods, the inside surface is machined vacuum grade aluminium with a glass lid. 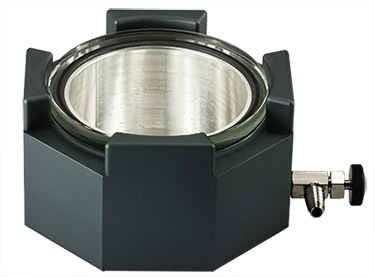 The EM-Storr vacuum desiccator is capable of reaching vacuum in the 10-4 mbar range. The vacuum connection for pump-down is a 6mm (1/4”) barbed hose fitting – compatible with 6mm thick wall silicon vacuum hose. The EM-Storr vacuum containers are stackable; the octagonal design is optimised for handling, strength and weight. Overall size of the standard EM-Storr 80 series vacuum storage container is 120x120x45mm; the sturdy octagonal EM-Storr vacuum containers are stackable. 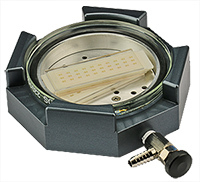 The maximum sample height including sample stub is 13mm within a circular cavity of Ø80mm for EM-Storr models 81. 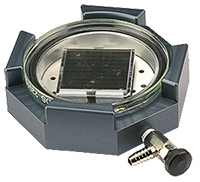 The EM-Storr model 83L comprises a sample chamber of 26 mm x Ø80mm; the taller EM-Storr model 83EL chamber size is 52mm x Ø80mm.. 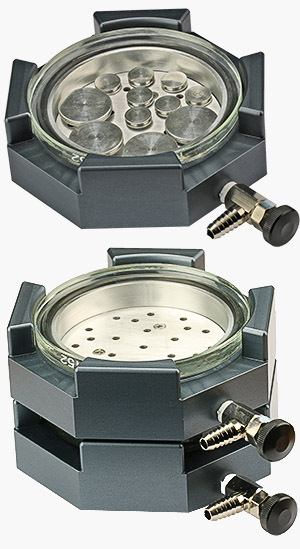 The large EM-Tec EM-Storr vacuum sample storage container has been made to the same specifcation as the standard EM-Storr vacuum container with a larger volume (Ø110 x 25mm) and larger glass lid of Ø130 mm. 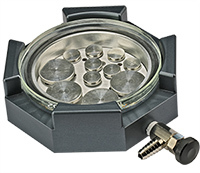 The overall size of the larger EM-Storr 110L vacuum storage container is 170x170x45mm to allow a maximum sample height of 25mm and a diameter of 110mm.